Poverty, illiteracy and lack of education can leave many people without basic knowledge to live safe and healthy lives. CRS regularly organises community-based sessions to raise awareness about different aspects of physical and mental health, sanitation and hygiene, so that people can improve their personal and household practices. 25 adolescent girls and women from the Sukantanagar community gathered on 10th February for one of these awareness programmes on “Reproductive and Child Health”. The event was led by Dr Prasenjit Saha who works within the Maternity and Child Welfare Department of a government hospital. During the session, the women learned about pre-natal and post-natal care including what to do and what to avoid doing during pregnancy, the importance of timely check-ups, good nutrition, hygiene and immunisation. 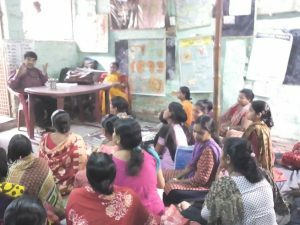 At the end of July, CRS teamed up with Netaji Eye Hospital to hold an eye camp at Basanti Devi Colony School in Kolkata. The CRS health team visited the neighbourhood in advance to inform the community about the free check-ups available. On the day, 87 people had their eyes checked. 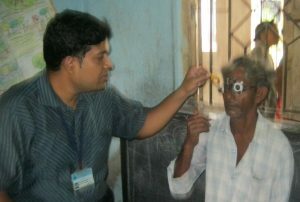 Eight people were identified as needing a cataract operation while 25 people were prescribed spectacles. Treatment and medicines were given free of charge thanks to the event’s sponsorship by Larsen & Turbo, an Indian engineering company.